" Alone in the Dark is a movie that isn't good, but it would've been a lot better off by being much worse than it is. If you're gonna be bad, then embrace your craptitude and go forth with gusto. " It has something to do with Edward Carnby (Christian Slater), a paranormal detective who hunts and tracks down the strange and unusual, teaming up with Tara Reid, a museum curator/archaeologist and his nemesis Stephen Dorff to fight the powers of evil. A gateway to Hell has been opened, or something, and it needs to be shut. Uwe Boll's despoilment of yet another video game series ensues. Alone in the Dark is a disappointment, but it’s in a way you might not expect. Some movies fail to live up to the hype of their praise, but this is a rare breed of movie that fails to live up to the hype of its ridicule. I wanted it to be so bad that it was good, but unfortunately, it doesn’t even “succeed” on that level. It has its moments, but rather than sustaining a constant stream of “entertainingly awful badness,” it just starts to drag and becomes a chore to sit through. Folks, I’ve seen Troll 2, and Alone in the Dark – you are no Troll 2. - The movie starts off with a 60-second scroll text. A narrator – who sounds a lot like David Carradine – reads it to us. Feel free to read along! Since this is loosely based on a video game, one can only assume that Boll wanted us to experience all the *COUGH* excitement *COUGH* of reading an instruction manual. Brilliant. - At the beginning of the movie, Christian Slater is sleeping on a plane dreaming about his past when he was part of a group of 20 orphans who were used for some weird experiments 22 years ago. When he wakes up, an incompetent kid actor barely manages to remember his lines and ask him if he had nightmares. Slater mumbles something about, “Yeah, I had this dream that my agent let me accept a role in a Uwe Boll mov…” but before Slater can finish his sentence the scene is cut. Very choppy editing if you ask me. - A huge creature with inhuman strength chases Slater and Reid into a room at the museum. They close the door and Slater yells at Tara to lock it. This creature just penetrated a dude’s skull and is rampaging through the museum, destroying everything it touches, but a locked door is gonna stop it? Maybe if they stuffed a towel at the bottom of the door the creature would have been even less aware of their presence. - Welcome to the world of awkward, out-of-place make out scenes. Out of nowhere, Slater and Reid start rekindling their old flame on a bed at the museum. Was that supposed to be an ancient artifact? King Tut’s bed, perhaps? Or does the museum just keep a bed with silk sheets handy? - Don’t you just love big fight scenes that consist of CGI creatures, loud heavy metal music, lots of darkness, and a little gunfire flash? It’s by design. You can’t see or figure out what’s going on, so I can only assume that Boll lives by the “if you can’t see it, then you can’t judge it too harshly” philosophy. - There weren’t nearly as many cheesy lines as there should’ve been, but Slater does manage to reel off a handful of stupid ones like, “Something tells me we’re not the first ones down here,” as he stares at an obviously MAN-MADE wall. Well thank you, Master of the Bloody Obvious. Those human skulls adorning the walls may have been a tip-off as well. - Why in the world are the soldiers setting a timer on a bomb to explode in 8 seconds. 8 seconds? Ever heard of giving yourself a few seconds to FLEE TO SAFETY?!?!?! Or was this a subtle, yet-oh-so-clever homage to the 1994 Luke Perry/Stephen Baldwin Lane Frost biopic? - There’s no way you can keep from laughing at what is possibly the absolute worst song to play over ending credits I’ve ever heard in a movie. Some band called Nightwish starts belting out, “I WISH I HAD AN ANGEL” and Mr. Shade and I immediately started doing bad Dokken impersonations. I was spinning around, doing haymakers with a fake guitar, and Mr. Shade was laying some heavy beats on his imaginary drum set. There IS entertainment value to be found in songs that sound like they came straight out of the 1980s heavy metal genre; you just have to look for it. It’s pretty sad when you’re sitting in the theater thinking, “You know, this movie would’ve been far more entertaining with Jean Claude Van Damme delivering bad one-liners in his broken English.” What Boll should’ve done is had Van Damme stare down one of the evil monstrosities, and as he removed a cigar from his mouth he’d say, “Looks like you’ll be alone… IN THE SPARK!” Then he’d open fire and blow the demon-spawn back to the brimstone from which it came. Maybe feature a scene with a Great White and an “alone… IN THE SHARK” line. Just go crazy. Those are the types of cheesy lines that are needed if you want to make a bad movie like this work. “Some doors are meant to stay shut,” Slater tells us. Yeah, and some movies are meant to stay unmade. Let’s hope it’s a lesson that Mr. Boll soon learns. Made a paltry $2.5 million its opening weekend. 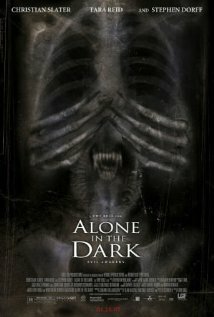 “Alone in the dark” describes what you were if you actually saw this at the theater. For those of you who don’t know, the Pinkertons were the first detective agency in the U.S. (established by Allan Pinkerton in the mid-1800s). Was Agent Pinkerton’s name chosen due to clever cuteness or just a lack of creativity? In a movie like this, I have to side with a lack of creativity every time. Ol’ A-Bomb played Alone in the Dark 4 on Playstation and enjoyed it much more than the movie. Here’s a choice quote from an actual “Open Letter” written by Uwe Boll himself: “Alone in the Dark is finished and this movie is way above movies like Underworld or Resident Evil.” Bwahahahahahaha. Riiiiiiiiiiiight. Let the words “An Uwe Boll Film” forever be a warning sign. Folks, the man has directed House of the Dead and FIFTEEN movies with Michael Paré (as of 2013). Need I say more? Christian Slater is in Bed of Roses with Josh Brolin who is in Hollow Man with Kevin Bacon. Lots of violence, and there are quite a few profanities (f-bombs, GDs, etc.). This one's not for mama or the kids. To be honest, there's really no one I'd recommend this to. Typically the babyliss Home business Dialogue : Which means, who cares about pretty much nothing triumphs?!? Hi! This is my 1st comment here so I just wanted to give a quick shout out and say I genuinely enjoy reading through your articles. Can you suggest any other blogs/websites/forums that go over the same topics? Many thanks! I adore your wp design, exactly where would you down load it through? But, there are pros and cons associated with each designer product and eyeglasses are no exception.If you don some Louis Vuittion sunglasses you happen to be setting up a critical manner affirmation. Hello superb website! Does running a blog like this require a great deal of work? I have no expertise in programming but I had been hoping to start my own blog in the near future. Anyways, if you have any ideas or tips for new blog owners please share. I know this is off topic but I simply needed to ask. Many thanks!